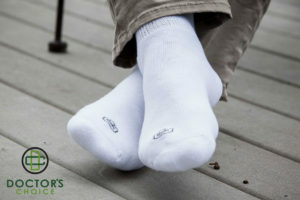 Doctor’s Choice® socks are designed for all-day comfort and the ultimate foot protection. 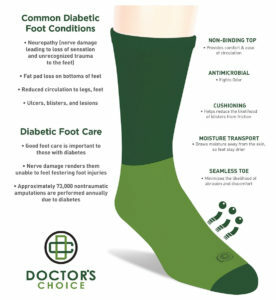 Whether you have diabetic circulation issues, or just everyday foot and leg sensitivity, Doctor’s Choice® is made for you. Our Diabetic Sock combine a non-binding top, cushioned foot, seamless toe and synthetic fibers that manage moisture to reduce the likelihood of blisters and abrasions. 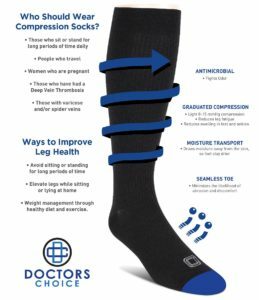 For those who sit or stand all day, travel, or have every day circulation issues, our compression socks offer the support you need. 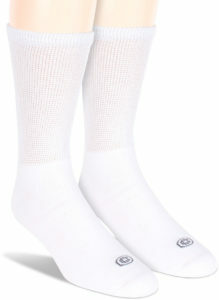 Our light graduated compression socks help reduce leg fatigue, pain and swelling.